What a great place to live. OTTO suits a range of lifestyles, from first time home buyers to singles to young families. You can choose a condo, loft or townhouse in this very stylish modern building. OTTO is designed around a central courtyard for added green space. Loft units embrace contemporary open plan living and you’ll love your rooftop patio. Townhouses offer private entrances and more spacious surroundings. Designed by Award Winning Architecture Firm HDR | CEI, OTTO takes its cues from the vibrant neighbourhoods that surround it, blending the best of West Coast Modern with just a touch of fun. The exterior façade combines a rich material palette of natural cedar, architectural concrete, acrylic stucco, and dark gray brick. Landscaping is thoughtfully designed to be low impact, with raised bed garden plots for aspiring urban farmers and a central courtyard with meandering pathways connecting OTTO to nearby Annie Park. The contemporary lobby has a central bank of mailboxes with integrated parcel boxes; you’ll never miss an important delivery again! The main floor also has an amenity room for resident use. OTTO offers secure underground parking for both residents and guests, including 6 electric vehicle-charging stations, as well as shared secure bike storage rooms located in the parkade and on the main floor. Select homes have storage lockers on the parkade level or second floor. Each unit comes with a Travelers Canada comprehensive 2-5-10 Home Warranty. OTTO offers four exclusive colour schemes, so you can pick the look which best reflects your style. Flooring, bathroom tile, and counter backsplash materials have been selected to compliment all schemes. OTTO’s contemporary interiors have been thoughtfully designed with your modern lifestyle in mind. Suites have wide-plank laminate flooring, plush cut & loop carpet, and oversized porcelain tile throughout. With concrete floor topping and acoustically separated party walls, you’ll forget you even have neighbours. First, second, and third floor homes feature airy 9’ ceilings. Fourth floor lofts feature soaring 18’ ceilings in living areas and have semi-private rooftop patios. Oversized windows and patio doors keep suites bright and each suite is fitted with energy efficient LED light fixtures (select fixtures). Laundry is also made simple with a full-size Whirlpool stacking washer and dryer in every suite. Your expertly designed open-concept kitchen will make cooking and entertaining a breeze. Complemented by your selected colour scheme, kitchens feature modern flat panel cabinetry, low-profile under cabinet lighting , stylish quartz countertops, and 2x9 high gloss subway tile backsplashes. Stainless steel Whirlpool appliances will delight your inner chef; while your stainless steel dual basin under-mount sink, and Moen high arc pull-down kitchen faucet will make clean-up simple. Otto bathrooms are stylish and serene, featuring a custom vanity with quartz countertop and backsplash, ceramic rectangular under-mount sink, single-lever bathroom faucet, Moen tub/shower fixtures in chrome and Dual-flush elongated toilet by American Standard. The 12x24 porcelain tiled floor complements the gloss white wall tile perfectly, and recessed pot lights and above mirror vanity lights offer ideal lighting. Your expertly designed open-concept kitchen will make cooking and entertaining a breeze. OTTO has been designed and built with Built Green Canada’s responsible sustainability practices. 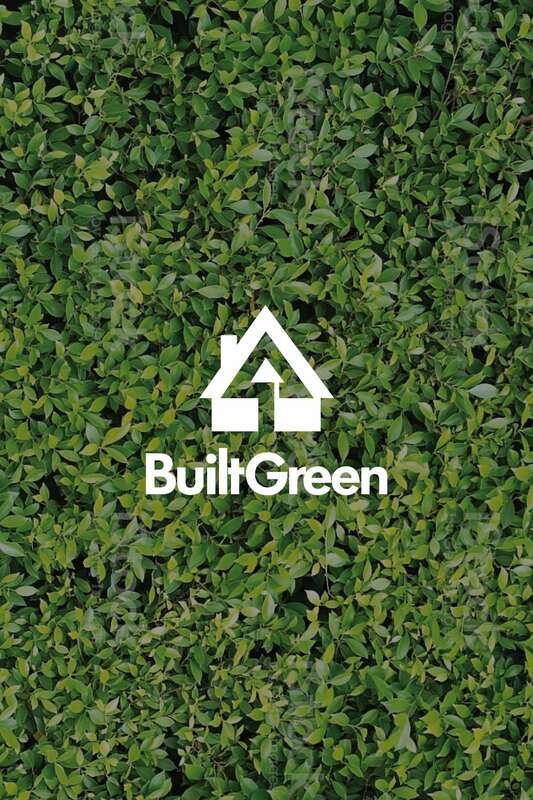 You can feel good about choosing a new home that is healthy, comfortable, and has a lower environmental impact.